Cover art by Frank R. Paul for August 1928 Amazing Stories. This is the famous (and valuable) issue containing "Armegeddon-2419 A.D.," by Philip Francis Nowlan, the first Buck Rogers story. However, the cover illustration isn't for the Buck Rogers story, but for another legendary story, E.E. "Doc" Smith's Skylark of Space. An interesting thing about Paul's cover image is its portrayal of the use of technology. Remember, this painting was produced in 1928. In the 1920's, only 10% of American households had telephones; some early phone subscribers had to be convinced that the devices were in actually useful and that diseases could not be transmitted over telephone lines. * Also, freon refrigerators were still around the corner, and televisions wouldn't be common in households for another two decades. So here we have a technologically challenged America, and Paul is showing us pictures of spaceships and astronauts and flying suits! 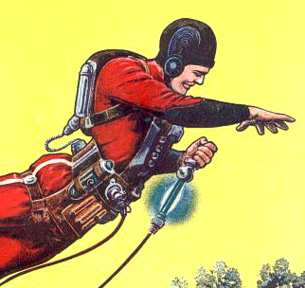 It is fairly safe to say that Amazing Stories, the first real science fiction magazine - and particularly Paul's covers - were many Americans' first exposure to such advanced technologies. So, the question arises: How is science portrayed? Is this new friend called "technology" good or evil? 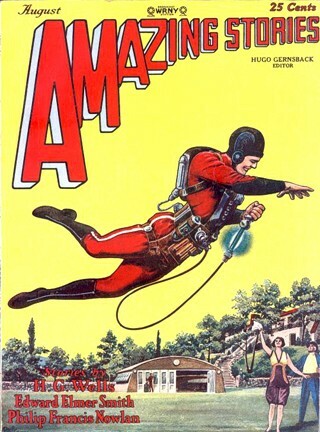 A quick survey of Paul's covers for Amazing and the Wonder Stories magazines showed that about 40% (35 out of 82) of his images associated fantastic machines with guns or violence: attacking robots, Martian death machines, flying buzzsaws cutting planes apart. In The Simpsons episode "Old Money," the nutty Professor John Fink is trying to solicit a grant for building a prototype death ray. However, Fink admitted that for the time being it "only has evil applications." Is this how Paul introduced technology? Indeed, lasers in Paul's images are only used to blow things up - preferably big things, like huge spaceships and even planets. There is no hint of "peaceful" applications for lasers like manufacturing, or eye or dental surgery, or accurately measuring the distance between the earth and the moon. 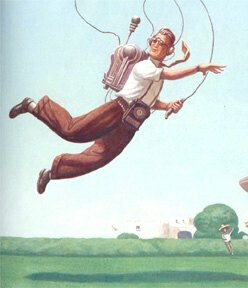 In addition to the illustrations of deadly lasers, Paul depicts no less than five times people physically carried off by robots (Wonder Stories, Oct. 1931; Dec. 1931; March 1933; Nov. 1933; Science Fiction, Dec. 1939). Violence is excitement, and excitement sells magazines. Overall messages: Technology evil, technology dangerous. 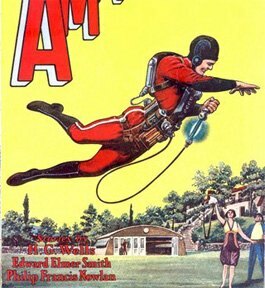 However, this 1928 image of a flying suit exemplifies the other major category of Paul's portrayal of technology: a mechanism for fantastic travels. Journeys into the wild unknown have been a staple of fantastic literature since before the time of Homer's Odyssey (c. 800 B.C. ); Cyrano de Bergerac's proto science fiction L'autre monde (1657) described a failed attempted to use a three-stage rocket system for space flight. Many of Verne's and Wells' classic novels were fantastic voyages. It seems a logical progression that Paul would also depict technology as a vehicle (metaphorically and technologically) for such journeys. In this 1928 image there is no hint of violence or any negative emotion at all - except perhaps the jealous posture of the earthbound man (the one standing in the corner next to the girl who is ignoring him and giddily waving her hanky at the flying man). Indeed, by my quick count, the number of covers depicting technology for travel (35) was about the same number as depicting technology for warfare. Not only can science be used to blow things up, but it can take us to wild places... not just teleporting us around the earth, but lifting us into the upper reaches of the atmosphere, even shooting us to outer space, the moon, and far-flung planets. That's excitement without violence. - F. W.
*See C.S. Fischer, America Calling: A Social History of the Telephone to 1940, Berkeley, Univ. Calif. Press.